This recipe is from one of my favorite cookbooks, The Italian Country Table by Lynn Rossetto Kasper. It’s another no-cook pasta sauce recipe, although not quite as fast and easy as the one we recently posted. I love cooking with mint and this recipe blends mint and 3 kinds of nuts into a course pesto that is just delicious. I just peeked into the cookbook before writing this post and saw that the original recipe uses string pasta of some sort (linguine, spaghetti or buccatini). I recall the first time I made it, I decided that I would use small pasta shapes in the future. But I would not dissuade anyone from making it with string-style pasta! As with a lot of these fresh pasta dishes, it goes really well with a flavorful pinot grigio or a dry rose wine. I just made this dish last night, and it was fantastic!! I love the nutty flavor of the pesto, and the freshness of the mint! And super easy, like Suzy says. I think it would also be good served with some grilled salmon or chicken, especially if you’re feeding more than 4 people. We had it with a simple green salad, and it was a perfect summer dinner! Mix the cooled toasted nuts. Coarsely chop about 1/4 of the nuts and set aside. Process the remaining nuts, the mint, garlic and red pepper in a food processor to a very coarse meal texture. Slowly add the olive oil and process until blended and a little smoother. This will not be as creamy as a classic basil pesto. NOTE: I have a mini-Cuisinart and recommend to first chop the nuts before processing with the rest of the ingredients if that is what you will use. It had a hard time with all those whole nuts! Cook the pasta according to directions, reserve 3/4 cup of the cooking water after done and then drain the pasta. Return the pasta to the cooking pot and toss with the pesto, adding enough cooking liquid to make a creamy sauce. Add a little at a time to make sure it doesn’t go beyond creamy to runny. Toss with the tomatoes and stir to blend. 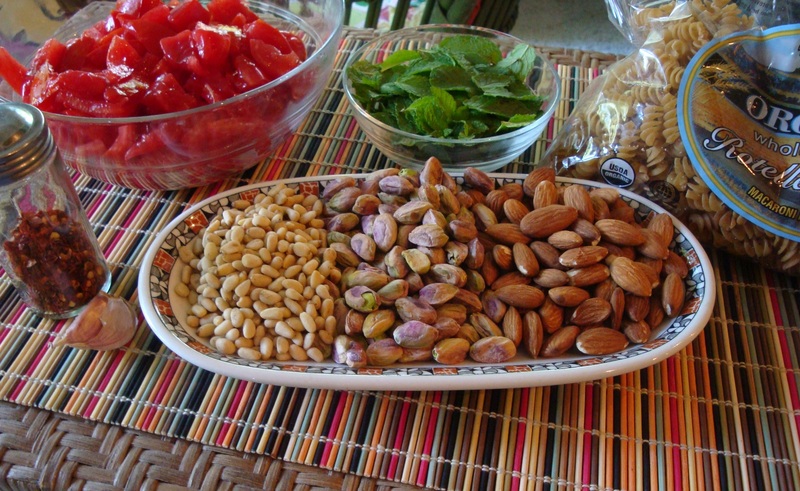 Toss in the chopped nuts and mint for garnish.